The Canadian economy’s dependence on staples created vulnerabilities when it came to the volatile commodity market. Success depended on demand in foreign markets for fish, fur, wood products, paper, grain, etc. A reorientation toward consumer goods in the mid-20th century meant that Canadians themselves could contribute to the stability of their economy by purchasing Canadian-made products. Also, after the Second World War, Canadian products were easy to find in many sectors, although competition from American and, in the 1960s, Japanese manufacturers would arise. The period from the early 1940s into the 1980s is sometimes described by economic historians as the “longest sustained boom in history;” its very length gradually made prosperity seem normal and hard times unthinkable. This was, of course, a delusion. After 1945, much of the economic action in Canada continued to centre on cities. The major urban areas were becoming metropolitan in their reach as suburbs spread outward into farmland. The rural periphery retreated to make way for more roads, single-detached homes, and automobiles. These bedroom communities were in fact the engines of economic growth for the manufacturing sector. Other resources, however, were being tapped. They included hydro-electricity and mineral wealth, both of which were typically found well beyond city limits and very often in the northern parts of Canadian provinces. The effect was to create new northern centres, greater province-wide integration (Hydro Quebec, with its enormous James Bay dam, is possibly the best example), and more provincial debt to service all of this new infrastructure. This was, therefore, a time of expanding provincial economies and administrative structures. Just as “nation-building” was a feature of the first 50 years of the Dominion, province building became a dominant feature of the political economy after 1950. The pulp and paper industry fed provincial coffers in most parts of the country, while relatively new mining opportunities – copper and molybdenum in BC, potash in Saskatchewan, nickel in Sudbury and Timmins in northern Ontario – reinvented the sector and created an important revenue stream for government. Similarly, uranium-bearing ore was being mined at Great Bear Lake in the NWT, in northern Saskatchewan, and at Elliot Lake and Bancroft in Ontario; it was refined at Port Hope on Lake Ontario where tonnes of ore were required to produce grams of useable uranium. Smelting, a companion industry of the mining sector, was another area of growth in Quebec and Ontario in particular but also in Trail and Kitimat in BC: the former continued as a prominent centre for zinc and lead production, while the latter was a new, purpose-built aluminum smelting town designed along the lines of a garden city made viable because of the cheap electricity that was provided by the province’s monopoly BC Hydro. Slight dips in GDP and little spikes in unemployment appeared in the early 1960s. It was only in the 1970s, however, that severe readjustments became necessary. The oil shocks of the 1970s and 1980s (see Section 8.10) signalled the beginning of the end for continuous growth, and ushered in threats to the state’s involvement in economic growth. Figure 8.E1 The prototypical shopping mall, Park Royal opened in 1952 in what was becoming Vancouver’s wealthiest suburb. Soon, everyone wanted one. Historians approach the study of shopping from many angles. It’s part of economic history, but it’s also rooted in social experience; it’s bound up in consumerism (which is, itself, a moving target) and has important ramifications for gender studies. There are significant spatial aspects as well: where do people shop for the many things they might need and how does that impact the function of a city? 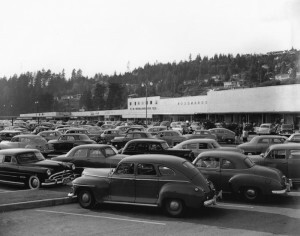 In 1952 the first shopping mall in Canada, Park Royal, opened in chichi West Vancouver. 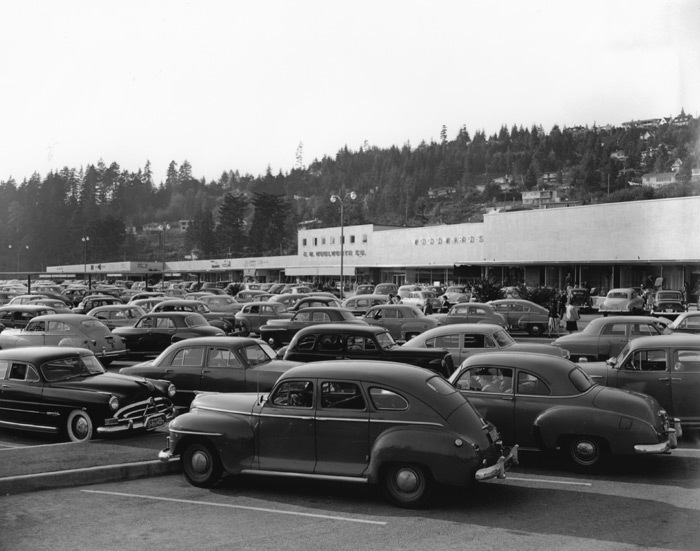 Whether a plaza or a full-blown mall consisted of department (or “anchor”) stores and many other outlets or just a large grocery store, they always bragged of “plenty of free parking.” In colder parts of Canada, malls were typically enclosed so to fend off bad weather. Many of these were designed with all the attractive aesthetic features on the inside, and plain, boring sheet walls on the outside. The mall was a revolutionary break from the old “high street” model of small and specialized shops including shoe repair, butchers, bakery, pharmacist, and hairdresser. Strip malls followed in the third quarter of the 20th century, some of which have, in the last two decades, attempted to recreate the scale and feel of the old urban or town environments. “Big box stores” arrived around the same time but went in another direction — away from the intimacy of small spaces to vast parking, utilitarian exteriors and interiors, and a mostly impersonal consuming experience. Look at the shopping environment around where you live. When was most of it built? What is its target market? How does its existence impact the social and economic life of the community? What features dominate? Parking or drive-thru? Attractive exterior or ugly box? What do these features tell you about its historical context? In the post-WWII years, much of the infrastructure-building activity switched from Ottawa to the provinces, which became more elaborate and sophisticated administrative units. The economic boom from 1945 to the 1970s was fed by new, massive projects and by a rising consumer demand in growing suburban areas. Park Royal Shopping Centre, 1952 is in the public domain. 8.15 The Boom Years, the Bust Years by John Douglas Belshaw is licensed under a Creative Commons Attribution 4.0 International License, except where otherwise noted.